Before starting the daily puja or any kind of special puja, it is customary to offer respects to the teachers, preachers, and saints of your family creed. This is known as the Guru stuthi or acharya vandanam for starting a puja. This Guru Stuthi is done after Ganesh stuthi or even before that depending upon the practices prevalent in your family traditions and faith. I am giving here my own experience or methods of offering prayer. So it is in our Vaishnava sampradaya to respect our acharyas from the oldest to the most recent ones chronologically in the below-mentioned hymns or slokas. The acharya vandanam order is given below in all the three languages of Sanskrit/Hindi, Telugu, and English with full meanings in the English language at the end. So, first, let me start with Sanskrit/ Hindi version of the lyrics. Then I give Telugu version and English version. 1) The first verse pays respect to MaNavaaLa maamuni also known as MaNavaaLa MaamunigaL who is a great sage. He took birth to complete the work that is left behind by Sri Ramanujacharya, who lived only for 120 years instead of 200 years. So, MaNavaLa took birth and completed all those works of spreading illumination to people. It is believed that this verse was rendered by Lord Sri Ranganatha Swamy himself in appreciation of the deep knowledge and contributions made to the bhakti Sahitya (devotional literature) by ManavaaLa MaamunigaL. Sri sailEsha refers to his Guru or Acharya, Thiruvai Mozhi Pillai. He was a resident of Srisailam. Lord says that Manavala Mamuni is the possessor of Thiruvai Mozhi Pillai's grace. But, this can be interpreted as being equally true for Lord Srisaila Himself, ie., Ranganatha Swamy Himself. Manavala Mamuni obtained the grace of God Sri Ranganatha Swamy, who came in the form of a small child and accepted Manavala Mamuni as his own teacher or Acharya and rendered this taniyan or verse praising his greatness that Manavala Mamuni himself is SrisailEsha dayapatran meaning that he has the grace of his teacher or Guru, Thiruvai Mozhi Pillai (and God's own grace). It is further said that Manavala muni has the qualities of wisdom and devotion ( dhibhaktyaadi gunaarnavam). Further, it is stated that he is the 'yatindra pravana' meaning that he has an unparallel attachment to the yatindrar ie., Sri Ramanuja Achariyar. MaNavaaLa is closely attached to Ramanujacharya. So, God in the form of a child says that He is bowing to such a great Ramyajamatru muni (Vande means bowing to). Ramyajamatru muni is another name of Manavala Mamuni. So, through this verse, God has established the greatness of Manavala Mamuni and instructed all people to render this verse at the starting of all worships to Him. 2) The second hymn offers credits and respects starting from God, who is considered as the foremost teacher or Acharya, and till your present teacher. It is an established belief that God offered the first mantra to Badari Narayana and then in the Vishnu form to Goddess Lakshmi. And, in the chain of acharyas come many great teachers chronologically after God and up to our present Guru. So in the second sloka, we are offering respects to all our teachers starting with "Lakshminatha samaarambhaam" meaning starting with God who is Lakshmi Devi husband and in the middle of teachers come the names of "Naatha muni and Yaamuna muni" (madhyamam means in the middle order); And up to our present teachers ("asmad aacharya paryantaam" means up to our present teacher). "Vande guru paramparaam" means - I bow to all these teachers' lineage. So, we are bowing to all the lineage of gurus starting from God and with Naatha muni and Yaamuna muni in the middle order and up to until our present teacher. 3) Then comes our most respectable Ramanujacharya, who is the founder guru of the "Srivaishnavism" way of living that has been preached by him for our salvation; which we are following now. This third verse says that the great preacher, who always considered God's lotus feet only as his most lovable and dearest asset, and thereby rejected everything else as some useless grass, that great person is our teacher who is an ocean of kindness and is equal to God. We are bowing to the feet of that great Ramanujacharya. 4) In the fourth sloka or hymn, we are bowing to the dearest saint Nammalwar, who is the first saint of this Kaliyuga born in the first year of kali yuga and lived only for 32 years doing great service to God and all people. ( It is believed that out of the 12 great saints of Vaishnavism, 5 were born in Dwapara Yuga and the rest in kali yuga). Nammalwar is considered to be nearest to God in the Acharya parampara tree-line. Sriman Narayana is first, then Goddess Lakshmi, then again God in the form of Vishwaksena or Badari Narayan and then, the next place is given to Nammalwar. The hymn says that we bow to the feet of Nammalwar, which smell with beautiful odours of the flower known as 'pogada puvvu'; which feet bestow us with the sweet love of mother and father, which help us in crossing these worldly sins and attachments just like a son leads us to heaven by performing rituals; and which feet provide us all the heavenly pleasures of happiness and even to our future generations also. We bow our head to such blessed feet of Nammalwar. 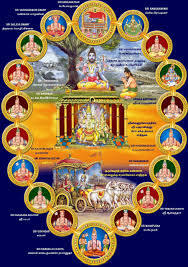 5) Now, in the last hymn, we are paying our respects to all the 12 alwars or saints (known as yogi-s in Sanskrit language) of vaishnava sampradayam chronologically- Bhutha yogi or pudatta alwar, Saro yogi or poygai alwar, Maha yogi or Peyalwar, (mahadahvaya refers to Maha yogi), Bhattanatha yogi or Periya alwar, Sri refers to Andal saintess, then Bhaktisara yogi or Thirumazhi Sayya alwar, Kulasekhara alwar, Yogivahan refers to Tiruppan alwar, Bhaktanghrirenu refers to Thondarappodi alwar, then Parakala muni or Thirumanghai alwar, Yatindra refers to Ramanujachariyar, mishran refers to Mishra Kavi or Madhura Kavi alwar and lastly Parankusha muni refers to Nammalwar. So we are bowing our heads to all these great saints daily ( pranatosmi nityam means I am bowing with respect daily). It is considered in this hymn Nammalwar as the central body, and all others as the other parts and limbs of the body. So, this is the importance of the daily chanting of all these hymns and verses or slokas before starting the daily prayer. We remember all those great saints and teachers including God and pay respects to them and then start the worship. How to worship, I have already described in my other blog at this Link.